This entry was posted in Other Cars on November 30, 2014 by Dan Martin. The Jaguar Club of Southern Colorado is developing a “Larenda Hershey Award” in memory of Larenda. We would like to select a recipient of the award this year and make the presentation at the Holiday party on December 6. Attached is a memo outlining the details and qualifications along with an application form for the award. The memo and application is also available at jagclub.org. Please review this document and if you feel someone meets the qualifications and should be considered for this award, please submit the application no later than Monday, December 1. You may email the completed application to Secretary@JagClub.org; mail the form to JCSC, c/o Jaguar Colorado Springs, 565 Automotive Drive, Colorado Springs, CO 80905; or deliver the application in person to Jaguar Colorado Springs at the listed address in Motor City. This entry was posted in Larenda Hershey Award on November 24, 2014 by Dan Martin. 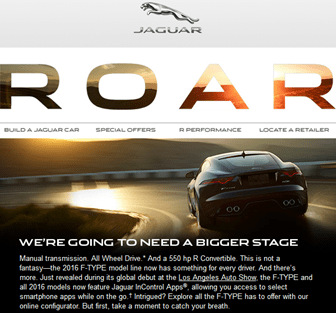 This entry was posted in Jaguar Designs on November 22, 2014 by Dan Martin. View from inside an H2O bubble – watch as it assimilates the astronaut’s hands. This entry was posted in News & Notices on November 17, 2014 by Dan Martin. This entry was posted in Other Cars on November 13, 2014 by Dan Martin.